The repetitive facilitation exercise (RFE) is one of the most common rehabilitation tactics for stroke patients attempting to regain wrist movement. Stroke hemiparesis individuals are not able to move that part of their body because they cannot create a strong enough neural signal that travels from the brain to the wrist. With RFE, however, patients get a mental boost. They are asked to think about moving. At the same time, a practitioner flexes the wrist. The goal is to send a long latency response from the stretch that arrives in the brain at the exact time the thought happens, creating a neural signal. The result is a strong, combined response that zips back to the forearm muscles and moves the wrist. It all happens in a span of approximately 40 to 60 milliseconds. “Timing is everything. When the window is that small, it’s not easy for two people to match each other,” said Georgia Institute of Technology master’s graduate Lauren Lacey. That’s why Lacey and a team of fellow Georgia Tech researchers created a mechanical device that takes people out of the process, replacing them with accurate computers. Their functional MRI-compatible hemiparesis rehab device creates a long latency stretch reflex at the exact time as a brain signal. So far, the research team has worked only with healthy individuals in their study. Study participants lie on a bed with the arm extended beneath a pneumatic actuator tendon hammer. In order to simulate the weak signal created by hemiparesis individuals to move their wrist, a transcranial magnetic stimulator (TMS) is placed on the heads of these healthy individuals at a 45-degree angle. Milliseconds after the hammer taps the wrist’s tendon, the TMS creates a weak signal in the motor cortex. The responses overlap, produce and send a strong signal back to the arm, and the wrist moves. The team has successfully varied the timing of the TMS signal and speed of the hammer to strike faster or slower depending on how much of a boost is needed to complement the brain signal. 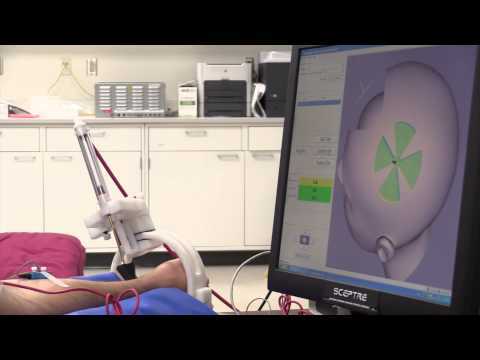 Now that the researchers have proven the viability of the TMS-actuator system, they will next work with stroke individuals. “The device is designed to adapt to people whether they are hyper, normo or hyporeflexive,” said Lacey, who graduated in spring with a master’s degree from the George Woodruff School of Mechanical Engineering. Also, because the machine is MRI-compatible, it will allow the team to study what is happening in the brain during rehab, opening the door for robotics. The Georgia Tech team was assisted by researchers at Japan’s Kagoshima University, Kazumi Kawahira, Megumi Shimodozono and Yong Yu, who originally performed clinical studies of conventional RFE. The device was presented at the Design of Medical Devices Conference in Minneapolis, Minnesota this spring. This research was partially supported by the National Science Foundation (NSF) under sub-award EEC 0540834. Any conclusions expressed are those of the principal investigator and may not necessarily represent the official views of the NSF.